On Saturday 14th June 2014 I took part in the hardest challenge I have undertaken so far! 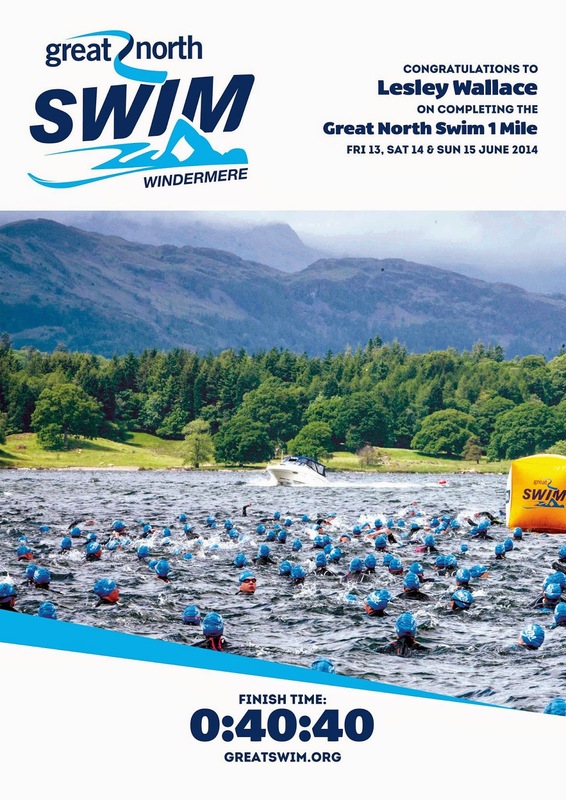 The Great North Swim 1 mile event! Although I can easily swim 1 mile in a pool, I had only managed to swim 3/4 of a mile in the lake during training and this had absolutely exhausted me. The thought of having to swim a further 1/4 of a mile was really praying on my mind and I truly didn't know whether I would be able to do it! The last thing I wanted was to be hauled out the water by a safety Kayak and get a DNF against my name! My alarm went off at 7am, although I was already wide awake anticipating the daunting task ahead! I was feeling extremely nervous and hadn't slept well. The night before I read a news report about a swimmer who had sadly died during the event earlier in the day which did nothing to calm my already highly anxious state! I got up and had some porridge for my breakfast, which I was also nervous about! Before running I always have porridge for breakfast but as I have never swam in the morning I was unsure whether this was a good breakfast to swim on, but hey ho it was time to find out! I was delighted that the weather forecast had indeed been correct and it was a lovely warm and sunny morning with thankfully NO wind! My swim time was 9.30am, but I had to check-in at 9am. Being aware of the lack of parking at the event we left home early at 7:40am for the 11 mile journey to Windermere arriving at around 8am to secure one of the last parking spaces in the car park at Brockhole! It was a 3/4 mile walk from Brockhole to the starting village at the Low Wood Watersports Centre. Being local we knew the way to go but even if you didn't you could just follow the many other people walking in the same direction carrying wetsuits and towels!! We arrived at the start village at around 8:20am and it was already bustling with activity! This being my first Great North Swim I wasn't sure of the setup so we had a wander around locating the changing rooms, the check-in point and acclimatisation area, and most importantly the start and finish lines! I bumped into a friend who was swimming the 1/2 mile route and stood and had a good chat with her too. We also spotted Rebecca Adlington (Olympic medal winner) who was starting some of the swimming waves as well as swimming it herself! I was surprised to discover that an elite swimmer was also nervous of swimming in open water! Rebecca Adlington in the centre! Once I was happy about the location of things I headed back to the changing marquee to struggle into my wetsuit! It was a very warm morning and I was wearing my Trisuit under my wetsuit so I just pulled my wetsuit up to my waist as I didn't want to cook prior to getting into the water! Most of the swimmers getting changed were all in the same highly nervous state and there was lots of friendly banter with everyone sharing advice and support and offering comforting words of encouragement! There was a wide mix of people all with varying amounts of experience ... and confidence. Once changed and ready to go I donned my water shoes and ensured my timing chip was secure on my ankle and made my way to the check-in area. I arrived just as the first wave of swimmers doing the 1/2 mile route were warming up, so we watched them start to see if I could pick up any last minute tips! Once this wave had started my check-in opened! At this point I put my wetsuit on properly and wrestled with my swimming cap to get it on straight and securely! I went through the check-in point where my race number was written on my hand in black pen (I assume this was in case my cap came off and I needed rescued then they would still know who I was). My timing chip was checked to make sure it was working properly and they also checked I was who the computer said I was! I was glad I had put my water shoes on because it was very gravelly on the walkways and it would have been very uncomfortable walking in bare feet, however once I was in the starting area the ground had mesh flooring covering it so I handed my shoes over the barrier to my husband and said farewell! We were led down to the acclimatisation area where we were told to completely submerge ourselves under the water and swim a lap of the area to get used to the water temperature! The water was actually very warm at 17.5C compared with the first time I went in 4 weeks ago when it was only 13C! Next we all accumulated in the warm-up area where we were given a safety briefing and the route was explained to us! An instructor then put us through a few gentle warm up exercises & stretches. Even hanging around wet I didn't feel cold at any point, although I think on a cool day this would have been unpleasant. With the acclimatisation and warm up done the next decision was where to position myself in the gaggle of swimmers at the start. All the fun swimmers, slow swimmers, breaststrokers, etc put themselves at the back with the ‘elite’ swimmers going to the front. After shuffling right to the back I got a little more confident and weaved closer to the front stopping at around the halfway point! I didn't want to get caught up in a mass of swimmers and be totally swam over but neither did I want stuck behind the breaststroke parade! Just after 9.30am, we all joined in with a countdown, the horn sounded and we were off! I could see the people at the front running down the jetty into the lake, however by the time it was my turn due to the congestion it had turned more into a slow shuffle! I entered the water and after a few steps delved in! I got jostled a little but tried to remain calm and relax into my stroke. “Just swim your own race”, I said to myself as I headed for the first marker. I manoeuvred out to the side to get away from the main throng of swimmers but this meant I was very wide on the first buoy meaning I was swimming more than I needed to! I concentrated on my breathing with the mantra "Bubble bubble breath, bubble breath", doing the two-one, two-one breathing pattern really helped calm me and enabled me to get extra air into my lungs! There was a bit of a sticky moment when I kept feeling something tickling my ankle! I kicked my leg out to the side to try and shake it off but it stayed firmly attached! I bravely put my hand down to feel what it was and felt rather stupid but also relieved to find that it was only the end of the timing chip strap wafting against my skin! I had a few panicky breaths and did some breast stroke, but actually, after this little upset, I was relatively calm and swam well and fairly consistently. I was surprised how well I managed to sight as this is something I struggle with when we are practising in the pool! However there were lots of other swimmers who were appalling at sighting and were veering in big zigzag's in front of people causing mayhem! I learnt to keep an eye out for these, and used diversion tactics to avoid! At one point one bloke was swimming across the lake in the totally wrong direction and a safety kayak had to go chasing after him! By the time I reached the half mile marker buoy I had settled into my rhythm and stroke and realised I wasn't as tired as I thought I’d be so I was able to give it a good go on the return. thankfully by this point I had left the "zig zaggers" behind (probably because they were exhausted after swimming double the required distance!) which made it more relaxing! I attempted to draft behind and alongside other swimmers but didn't like the hemmed in feeling this gave me and preferred swimming in my own space even if it meant having to work harder to cover the same distance! I could locate the big yellow buoys marking the course whilst swimming fairly successfully but really struggled sighting the small orange ones marking the finish line! 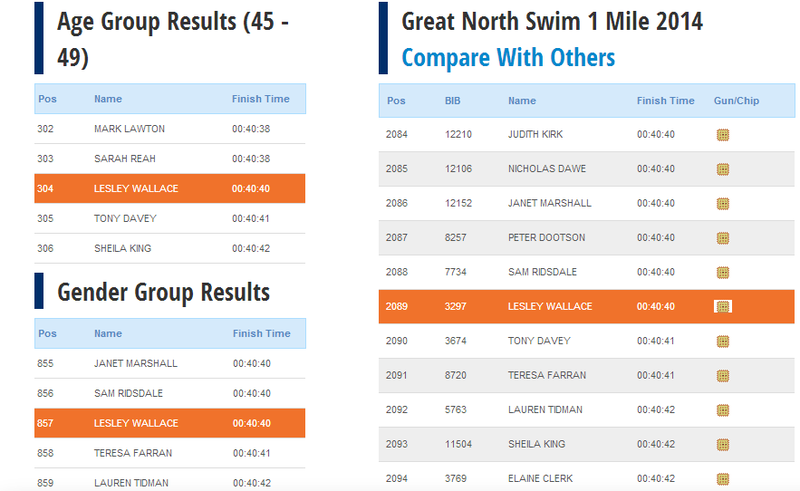 Unfortunately I had lost sight of all the swimmers in front of me so I was leading the second pack to the finish line! I did think about slowing to allow someone in front of me so I could follow them but this goes against my competitive nature so I just kept having extra looks to ensure I was heading home! My sole goal pre-race was just to finish and here I was thinking about the time! Before I knew it I was swimming underneath the finishing board and was getting out the water on wobbly legs! Luckily there was people helping swimmers out until they were steady enough to go towards the finishing timing mat unaided! As I headed up the ramp I was clapped and cheered by the spectators! I felt quite a celebrity especially when I was stopped at the top and had a microphone stuck in front of my face to be interviewed! I have no recollection of what I said as I was so elated at being finished, although I do remember being told I had finished in 40:40! I then staggered to collect my finishers bag and got my well deserved medal! At this point I was reunited with my husband! I headed to the changing marquee to get into some dry clothes and after getting a well earned ice cream we went to cheer some other swimmers over the finish before heading off home. Walking back to the car park there was still a steady stream of swimmers arriving for their swim wave. I was amazed at the amount of traffic trying to get past the event through to Ambleside. The traffic was at a complete standstill and was tailed back for miles! I hope there wasn't anyone who was swimming stuck in it as they wouldn't have made it in time! I was delighted that we were going in the opposite direction! All in all I feel a huge sense of achievement at actually facing my fears and going through with it! It would have been very easy for me to back out at the last minute as I was absolutely terrified! I was surprised when I viewed my Garmin that it seems like I swam in a relatively straight line and I didn't swim much further than the 1 mile! You can view it here! Now that I have done it once ... I am eager to enter again ...perhaps the 2 mile one next time ... or the 5k? Who knows? !